Hitting (9AM) and Pitching (1PM) Camp will go on as scheduled no matter the weather. We are blessed with one of the best indoor facilities in the country. Your camper can dress in shorts, t-shirt, and tennis shoes. You will need to bring the necessary equipment for the Camp (Hitting – bat and batting gloves) (Pitching – glove). If your camper is attending both the morning and afternoon camp they can pack a lunch and eat with the staff, or you can take them during the hour break to get something to eat. Registration for each camp will begin 30 minutes prior to the start of camp! Road Construction! 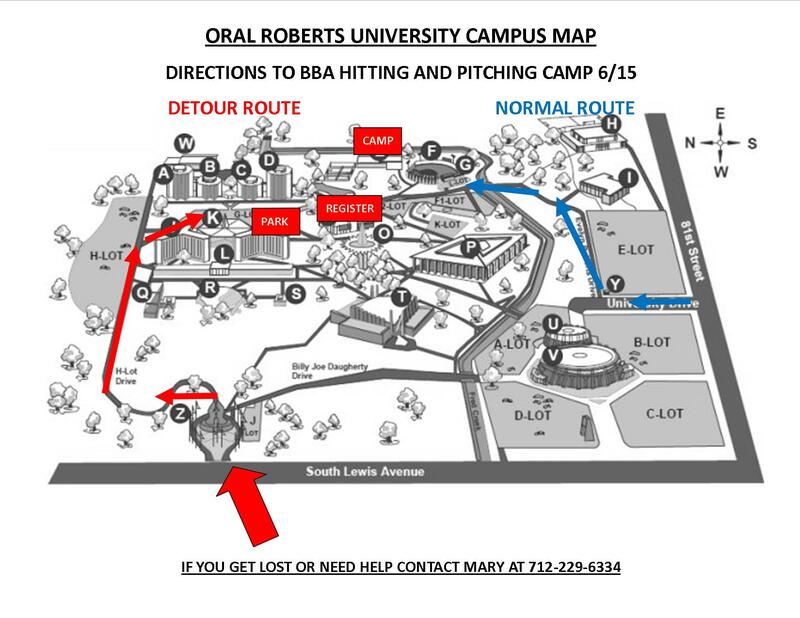 Weather permitting there will be road construction going on ORU’s campus this week. You can attempt to get to the field the normal route if you can. If the construction is taking place you will need to use the detour route in the attached photo. The alternate registration will be in the Armand Hammer Building for convenience, then your campers can walk to the HA Chapman Indoor Facility. If you have any issues please contact our Camp Registrar Mary for more information.